A New Power Ring Debuts in Planet of the Apes/Green Lantern, And Here's Your Exclusive First Look! Planet of The Apes/Green Lantern is coming, and with it, an addition to the complex history of the Green Lantern emotional spectrum. Written by Robbie Thompson (Silk) and Justin Jordan (Green Lantern), and illustrated by Barnaby Bagenda (The Omega Men), Planet of the Apes/Green Lantern debuts February 1, and the first issue will introduce the Universal Power Ring, a weapon created by the Guardians that harnesses the power of the emotional spectrum. You can get your first look above, and see a page where it's operating in-story in the attached image gallery. "One of the coolest things we were able to do was to explore new corners of the mythos for both the Planet of the Apes and Green Lantern," said series editor Dafna Pleban. "Robbie and Justin really wanted to find a way to make the threat to both properties as visceral and essential as possible. 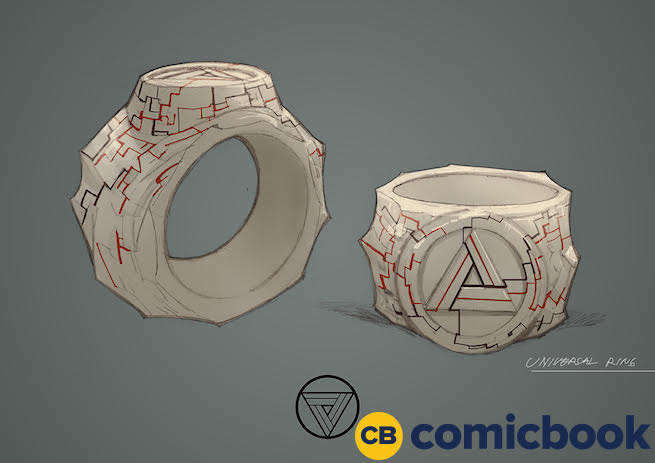 Creating a ring that amplified all the conflicting emotions Cornelius has for his home --his hope, fear and everything else-- felt both narratively engaging and just visually cool, something that Robbie, Justin and Barnaby captured really well in this design. How it got to the Planet of the Apes, and why? We can't wait for you to find out." This isn't the first time there's been a ring that could do more than just harness one element of the emotional spectrum: the blue rings can enhance the power of other rings, while white ring calls on the power of life itself and allows its user reality-shaping powers. Currently a storyline involving a "Phantom Ring," which lets the user wield the power of the ring most tied to their current emotional state regardless of their "worthiness" of the ring in question overall, is playing out in Green Lanterns. The issue's final cutoff date is today, so call your retailer right away if you want to be sure to get one.